Chechnya's new leader vows to destroy rebels after contested vote. Grozny, Chechenian Republic( AFP), | 17:05msk, 30 August 2004|. The Kremlin-anointed career police officer elected Chechnya's new leader in a vote condemned by many observers vowed to consign separatist extremists to the "dustbin of history". Alu Alkhanov won a crushing victory in the weekend's presidential vote, but there were questions over how election officials managed to report dizzyingly high turnout figures when polling stations had often been deserted. The election were forced by the assassination in May of the former president by separatists who have been waging a brutal struggle with Moscow over the past decade. With all the votes counted, Alkhanov had reduced the other six candidates to the status of also-rans by polling 73.48 percent, according to local election officials. His nearest rival, Movsur Khamidov, polled only 8.94 percent. While the official turnout was 85.24 percent, the respected rights group Memorial said the "election should be declared null and void due to the weak participation. Everything else is just falsification." As soon as his victory was confirmed, Alkhanov, currently Chechen interior minister, earmarked security as his top priority and reiterated the Kremlin's hardline stance against negotiations with separatist leader Aslan Maskhadov. "Maskhadov and (radical Islamic) Wahhabism have no future in Chechnya," said the 47-year-old, who most Chechens had never heard of until a few months ago. The extremists "may kill and make explosions, but the will of the people has thrown them into the dustbin of history and Maskhadov has chosen this way himself. The talk of the imaginary legitimacy of Maskhadov is misplaced," Alkhanov told local news agencies. He vowed to maintain the policies of murdered president Akhmad Kadyrov, a pro-Moscow former rebel, "to rebuild the economy and assure security for the inhabitants of Chechnya". Fear of attacks had cast a long shadow over Sunday's election, which came just a week after up to 50 people were killed in a rebel raid on the Chechen capital and was marked by the death of a man who blew himself up outside a polling station. It also followed the near simultaneous crash of two passenger airliners on flights to southern Russian destinations last week, which many have blamed on female Chechen suicide bombers. Many residents of Grozny decided to stay away from the streets of the bombed-out city at the weekend, fleeing to the countryside or staying indoors. But on Monday Grozny was once again coming back to life as market stalls filled with goods, cars picked their way around pot-holed roads and people walked in the hot and dusty streets. However questions remained about how so many could have voted when observers reported an almost total lack of activity at polling stations on Sunday, with the Russian press expressing incredulity. "The name of the winner was known in advance. This as well as the threats of the rebels and the good weather meant Chechens lost any desire to go to the ballot box," said the daily Kommersant. 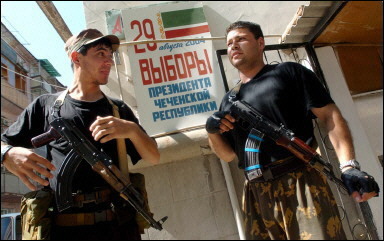 Osam Baysayev, a representative of the rights group Memorial in neighbouring Ingushetia said that "in reality there had been no presidential election in Chechnya". He said in the northern village of Mekenskaya no-one had voted before 2:00 pm on Sunday, but the authorities were still boasting a turnout of 35 percent. "Whatever the voting slip that goes into the ballot box looks like, the candidate chosen by the Kremlin will be elected. And to the indifference of the international community," said a Chechen official with the pro-Russia administration. However, local election officials vehemently denied the charges of foul play, saying international observers like the Arab League had given their blessing to the vote. If journalists had only seen empty polling stations "then you managed to arrive at the wrong moment, these things happen," said the republic's top election official Abdul-Kerim Arsakhanov. Alkhanov is assuming perhaps the most dangerous job in Russia -- Kadyrov was slain after less than a year in office and Maskhadov has vowed from his presumed hideout high in Chechnya's remote mountains to kill the republic's next Kremlin "puppet".